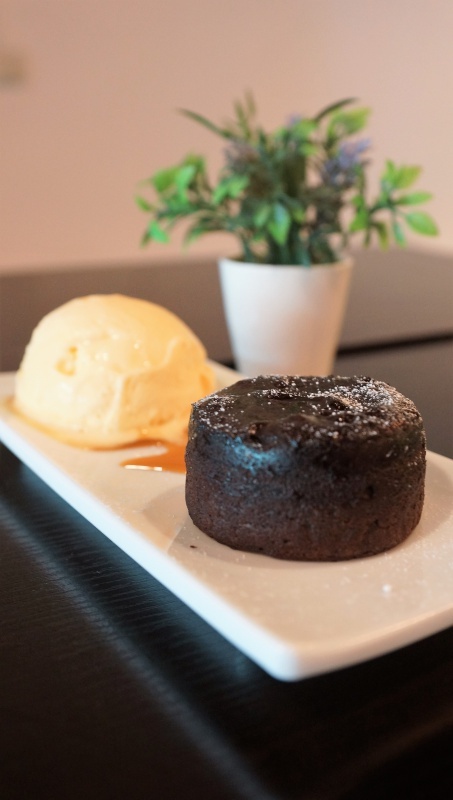 Black White Tale is a dream come true for a young couple – Robert and Elise, both have a strong passion for good food and the opening of the cafe signifies a significant milestone in their life. The café favours simplicity in decoration; From the furniture to the walls, the black and white theme lends itself to both cosy and comfy interpretations. At Black White Tale, quality comes first on the agenda. Besides the quality ingredients used, Chef Robert meticulously prepares each of the dishes with soul and heart, hence business logo tagline – Soul Food So Good. And we have to agree, the food here is really good. Carbonara thickly coated in cheese after being tossed. The chef prepares the carbonara right in front of the customers. Hot pasta is cooked in a freaking full and round giant cheese wheel. Tossing the hot food in the wheel will slowly melt the layer of the cheese, evenly coating the pasta for a nice and cheesy carbonara. 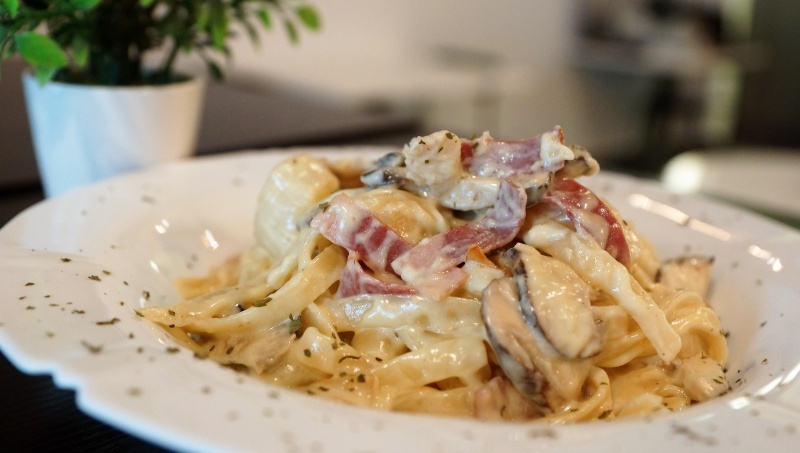 Everything on the plate of the carbonara was incredibly good, from the al dente pasta to the enthralling cheesy flavour, everything was well balanced to present you a high standard carbonara, a highly recommended dish to order when dining here. 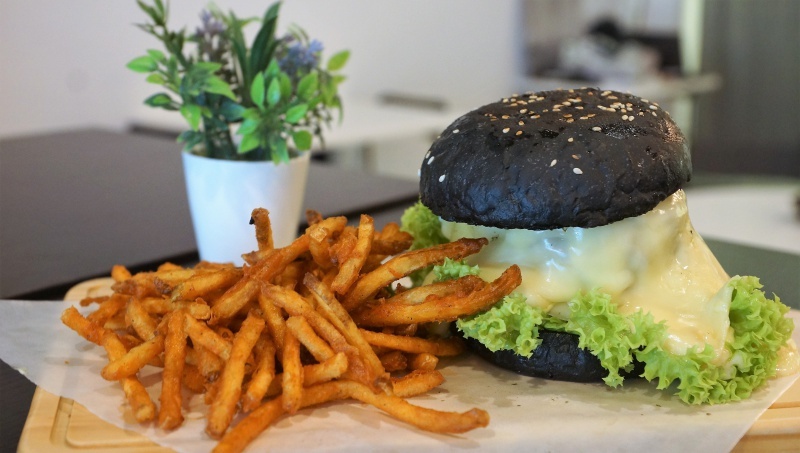 A thick ground beef patty smothered in melted raclette cheese and sandwiched in a charcoal burger bun. A heated wedge of raclette was brought to the table and we watched as the melted side was scraped off to cover the juicy beef patty. The combination of the savoury raclette and the natural flavour from the beef patty provided a well harmonised flavour. A juicy thick patty completely covered in so much cheese, it’s oozing off the lettuce. Shoestring fries serve as a side dish to the main. We were glad it was not the usual fast food featureless French fries but very well-seasoned shoestring fries, nice golden brown and a perfect accompaniment to the burger. It is another recommended item to order on the menu. 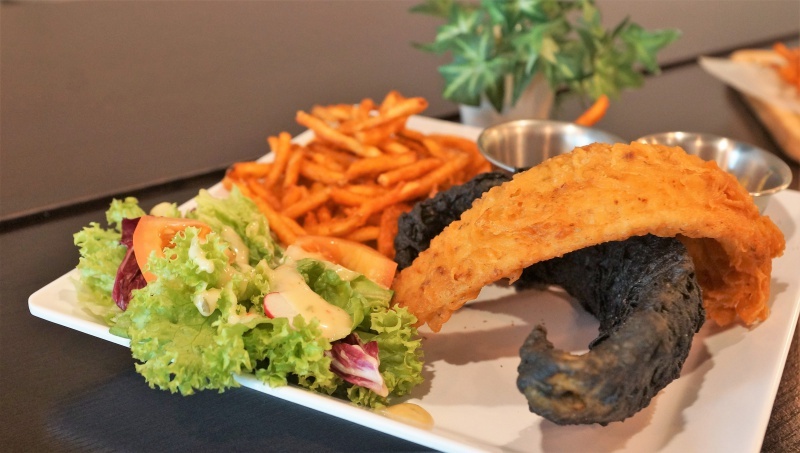 A generous topping of molten raclette covering the breaded thigh. 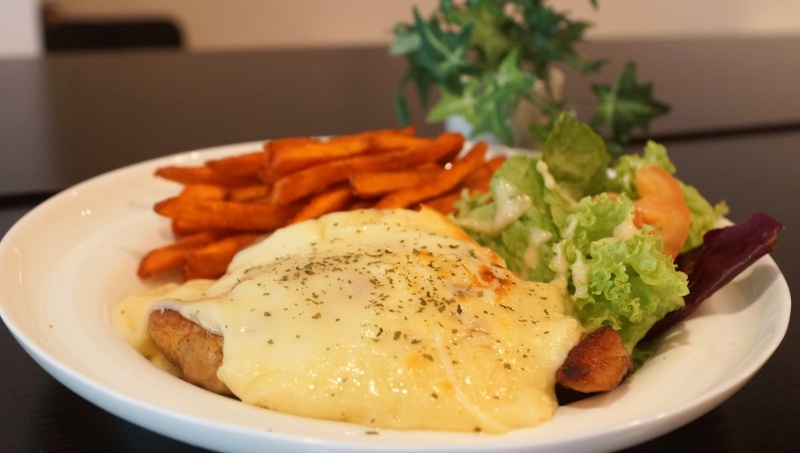 Panko crumbed chicken thigh, tomatoes concasse and drenched with grilled Raclette cheese. Chicken thigh is well marinated and very much retained the juicy tenderness. The sweet potatoes fries were very appealing to the taste buds as well. Battered fish in black and white to fit the theme. 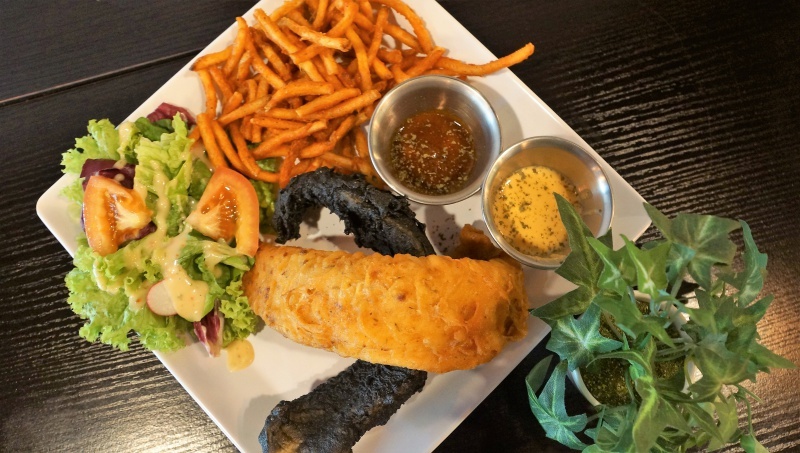 Two strips of battered fish in two different colours – a usual golden brown and a charcoal batter. The flesh was tender and moist, the batter was thin and crispy, served with flavourful chilli crab and salted egg sauces. This is another signature dish highly recommended. Comes served with a flavourful side of shoestring fries. Not on the menu yet but we had the opportunity to try it. The not too sweet chocolate went well with the smooth vanilla ice cream, another few seconds with the heating would have probably been more ideal to allow the lava to flow smoothly. We are pretty much enamoured of the chef’s culinary skills at Black White Tale. Besides the impeccable depth of the food quality and excellent customer service, the price here is very reasonable and giving every reason for a return visit. Soul Food, So Good – we fully endorsed it. 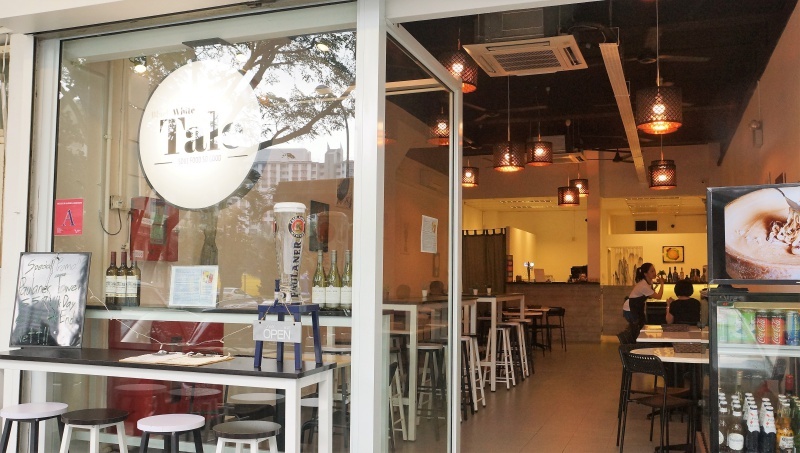 Black White Tale Cafe — CLOSED FROM 21st OCTOBER 2018.